Whilst the children are still on summer holidays and we are enjoying temperatures in the mid to high 20s, in the bee world it is already autumn. By the beginning of August the colony is beginning to shrink in size and forage is reducing. By the end of August there really isn’t anything of substance for them to collect, beyond nectar from a few garden flowers and some blackberry. They have kicked out most drones and, if they are not ‘queen right’ now, then there is no chance of them raising a new queen. Their only hope is the introduction of a fully mated queen, ready to lay. They are therefore in full autumn mode and preparing for winter. By the end of October, whilst we will still be enjoying autumnal weather, they need to be fully bedded down for their winter. 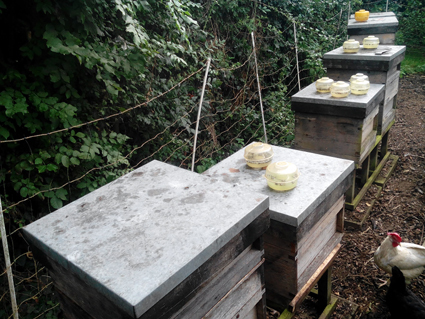 So, this is the apiary today. Gone are the 5 high stacks of supers full of honey. They now have a maximum of 2 supers, most fewer. This is just to give them room for the bees, as they reduce in numbers to their winter colony size of around 10,000 bees. Their biggest threat right now is from varroa and wasps. More on dealing with both of these pests next time. 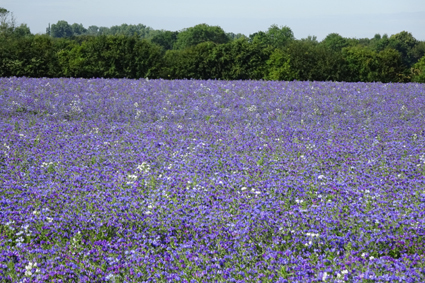 I’d like to take you back a few weeks, to when I posted a picture of the beautiful echium crop being grown one field away from us. Our local farmer is always looking to new crops, and so this is the first time it has been grown in the area. It is grown for its oil, as an alternative to fish oils, and for medical uses. 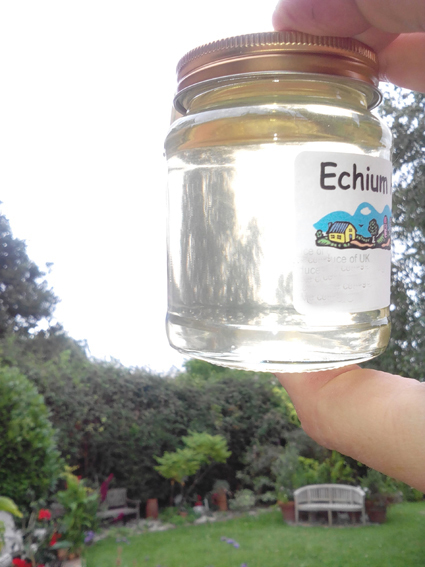 We were hopeful of a good honey crop, especially as echium is related to borage, which gives a beautifully light and delicate honey. Well, the honey is every bit as delicious as we had hoped. Like borage, it is almost transparent in appearance. The flavour is light and delicate, perhaps even more so than with borage. Today Mildred reached a mileage milestone. It might only be 5000 miles, but, trust me, every mile driven in an Austin seven is worth 50 in driving experience in a modern car. As you can also see, we were ‘cruising’ at 20mph at the time. We had a lovely day out. Starting here and moving on to one of our favourites, the Fry Gallery. We finished up at Audley End for a quick visit. On the way Mildred reached 5000 miles with us. That’s over 9 years, so we haven’t exactly been piling on the miles. 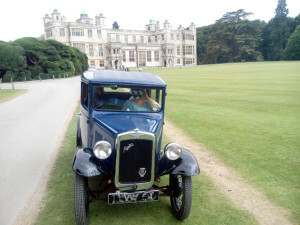 I once read an article saying that all learners should have a lesson in an Austin Seven, and I get the point. Drivers today are isolated from the dangers out there. Most have never heard of aquaplaning and will happily drive 10m from the bumper of the car in front at 70 mph in torrential rain. They have little understanding of the fragility of life and the fact that they are trusting theirs to 4 small patches of rubber, the only thing attaching them to the road. If they had to drive a car with limited brakes, low power, requiring planning to get up the slightest of hills, no air bags, power steering, air conditioning, ABS or seatbelts, then they might just be better and safer drivers. 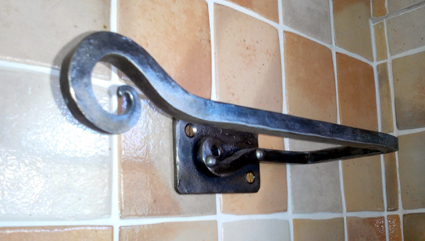 The second of my blacksmithing bits and pieces posts is a kitchen towel holder. This is typical of the types of pieces I enjoy making, perhaps my emerging style. Solid metalwork, made to last (I hate the cheap and cheerful look of spindly metal made with the thinnest material you can get away with), combined with organic themes, through the twists and curves. It is then finished off with traditional exposed rivet steel joining techniques. 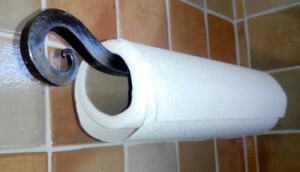 In case it isn’t obvious, this is what it looks like with the towel roll in place. Not everything I make on the forge is a sculpture, or a complicated plant support. This week I also made a simple towel rail, made to fit a new kitchen, as there was nothing available off the shelf. It fits inside a drawer with limited space. 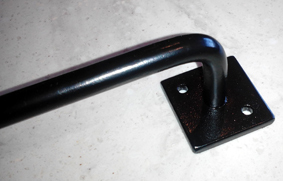 It is made from 10mm round steel, welded to 40mm square pads, all painted satin black. More simple bits and pieces tomorrow.